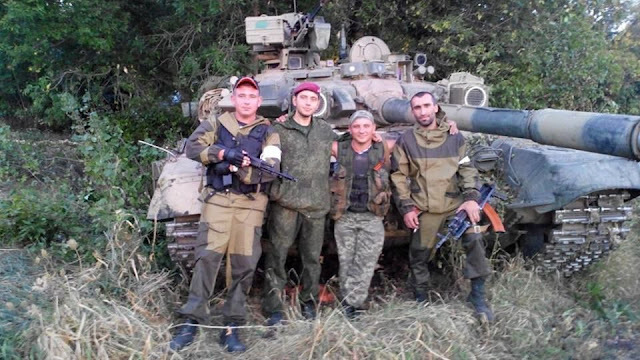 It has been a long debate whether Russian T-90s were involved in the battle for Lugansk Airport. But by now we can be sure they did. It started with this article from Inform Napalm. It means these tanks passed this location AFTER August 31st. The question is: is it a T-90 too or not? Notice the green paint on the boxes, but also note the patterns of the paint are not the same and thus these are not the same T-90s. 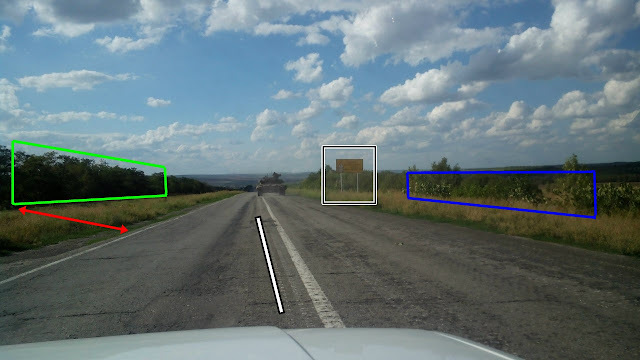 Note the road leading to the left in the third photo, what means the position must be as indicated. The T-90 photo should be somewhere out there too. Note that the sun/light comes from (slightly left of) the side of the cameraman. This means the T-90 must be at the southern side of a tree line. That treeline seems to be a single line, not a forest. Also note that the ground on the right side of the photo is burned. 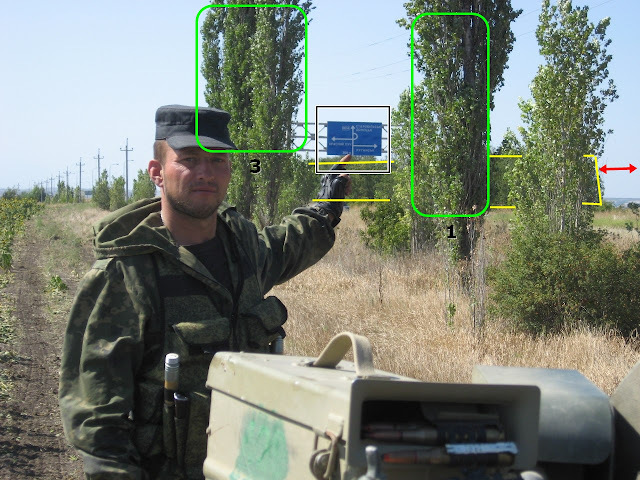 The patterns are very different, but the pattern on the upper ammo box (from the 'ammo box photo' near the Lugansk traffic sign) matches with the pattern of the first out of four others (from the Lugansk Airport photo). 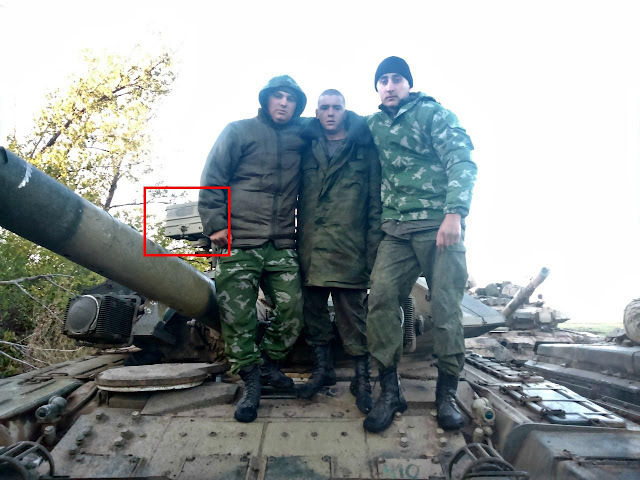 This is more proof that the 'ammo box photo' indeed is a T-90. But, assuming the 'ammo box T-90' also travelled in the convoy, it also shows from which directing it might have come (East). 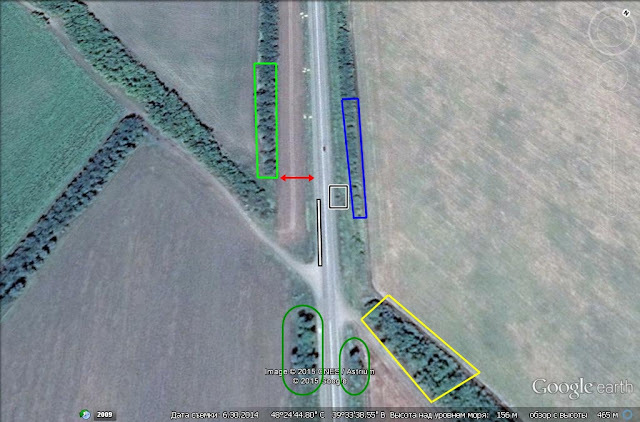 Remember that the August 31st satellite image shows AN ACTUAL BATTLE for Lugansk Airport going on? See this blog. It means the T-90s must be out there somewhere...! It just happened to be so that I missed out on one position in that blog :-(. We can start at the known 'ammo box photo' position. 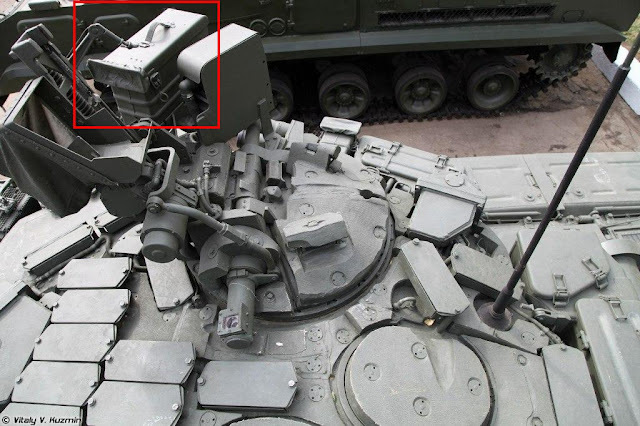 On the 31st the T-90s had not reached that position yet, because the tracks only appear on a later date. We know the convoy was seen in the East. So the T-90s most likely came from... the East :P. And East of that position is a small village called Ternove. There is lot's of armor there (red circles)! BMPs, trucks, BTRs, maybe BMDs. But there are also a couple of big fat tanks (yellow circles). It's simple: those must be the T-90s. The two on the bottom have a truck next to them, so they seem to get new supplies. 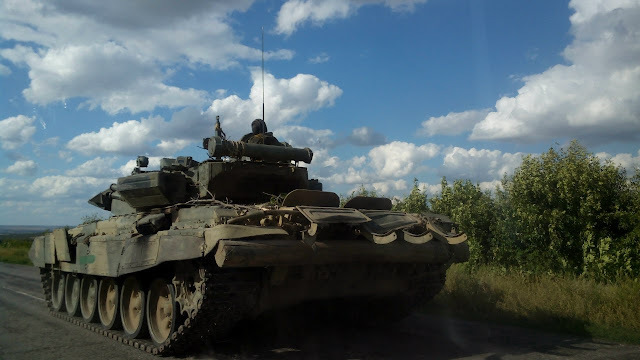 There is a good reason why Russia deployed T-90s against Ukraine near Lugansk airport. 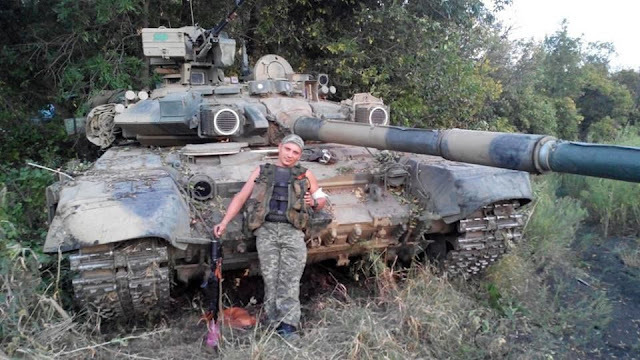 Ukraine had sent it's best tanks there too: the T-64 Bulat. Either the red route, or even the orange one. 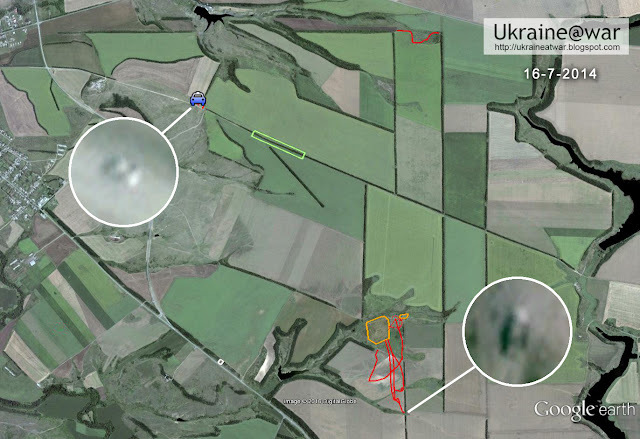 New Google Earth maps reveal that the Russian BUK-battery East of Kuybyshevo was already operational during July 2014. 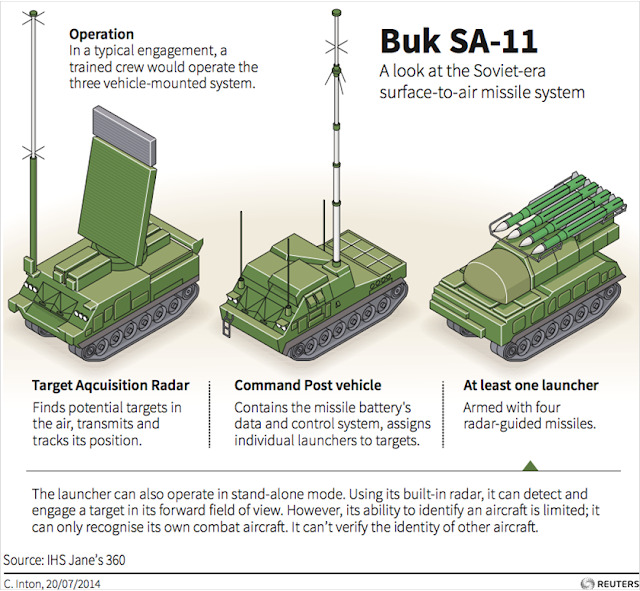 That means the BUK that shot down MH17 could have communicated with the ones on Russian soil. 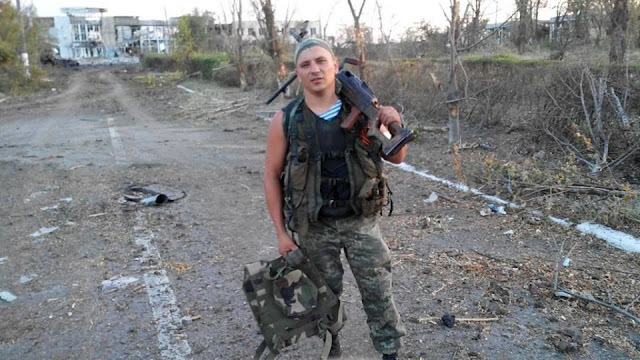 Here is an earlier publication of this BUK-battery, so we can be sure it was there. Up till now we only had satellite image from 2013 and then September 4th 2014. Now images of 29-6, 2-7, 20-7 and 4-8 have been added. What has been done to create the images in this blog is to trace every unique track and position on every subsequent satellite image where it FIRST appears. If it's also on the next map, it is further ignored, although it doesn't mean it hasn't been also used on that date. Also commonly used tracks and roads are ignored. By using this method, we can see unique activity that must have happened before any specific satellite date. Green areas = tracks into/from treelines indicating (abandoned) campsites. Not much can be seen, but there are two noticeable areas. 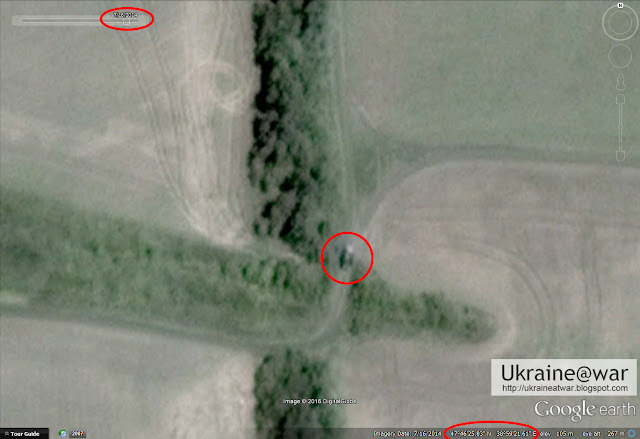 The first is at the known BUK-team position (green area), where they had a kitchen and dug-in trenches. Electricity poles run from left to right on the image above and there are tracks leading to/from these poles. So it is very well possible that on June 29th a team was already there making preparations, or already positioned and waiting. Clearly tracks can be seen of a heavy machine manoeuvring in the corn. Because of the corn the tracks are obscured, but they are still so profound that they are still visible. Farmers don't damage their own corn like that. Military vehicles do. For the rest there is not happening anything. There is a big one leading to the trenched position (green). And there are several tracks (red lines) and positions with multiple tracks and turns (orange areas). Note that the July 20th map ends at 1/3 of the bottom. It's only the darker area. The lighter bottom part is from the July 2nd image. That's why the red track leading to/from the trenches can not be traced further down. We can clearly see vehicle tracks arriving and leaving the area again, as well as positions where they must have been deployed and operated. It is possible that multiple vehicles where deployed here at the same time, or that one or more visited the same spot again on another day and a little bit further from the previous position. In the upper side we can see one position similar to the four we saw in the previous area. This is an indication that only one vehicle caused all these different tracks on different days. Not much can be seen, because it is covered with layers of mist/clouds. Only one small part of a track can be seen, along the red line in the area. Because part of the tracks where already visible on the July 20th image, all of them must have been made on the 20th of July. They just look like tracks, although it can not be 100% excluded that it was a deployment area. Either way it shows their was activity here. 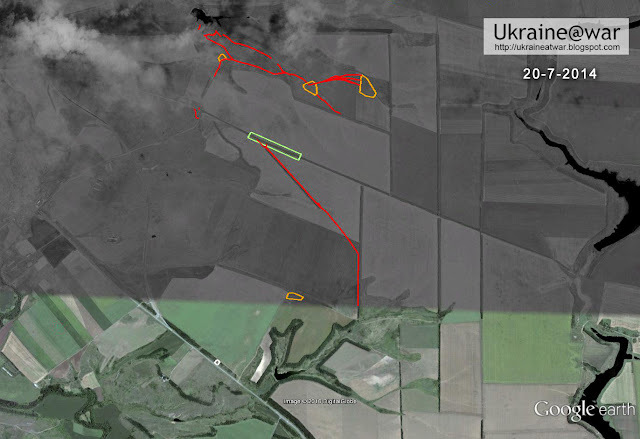 These tracks and positions are a clear indication that the BUK-battery was fully operational before July 20th. Clear positioning and manoeuvring can be observed, but not necessarily by multiple vehicle on one day. Since the July 20th image did not include this area, it might as well have been from an earlier date then July 20th. It's unclear what exactly happened here. 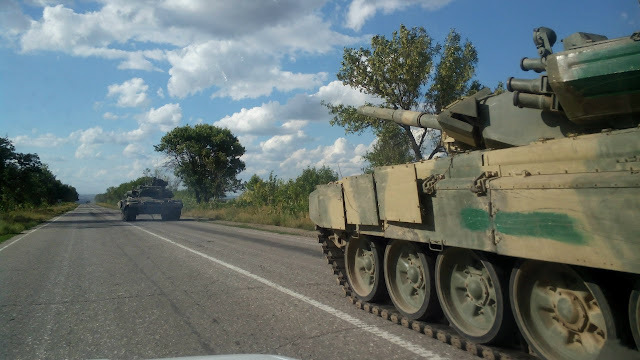 During August major Russian invasions and offensives took place in Ukraine, so a lot of activity is logical. As well as some objects/vehicles (yellow circles). 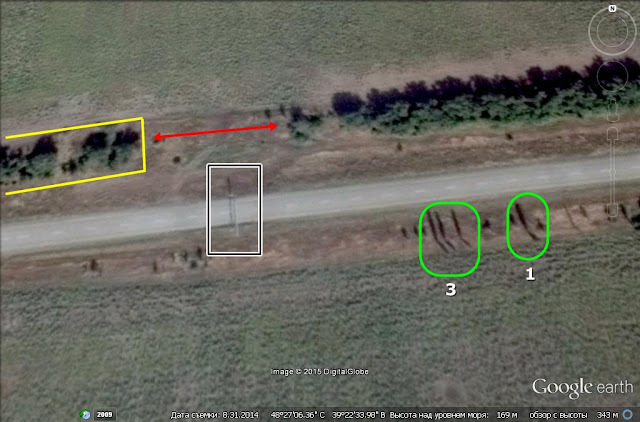 Therefor it seems very unlikely that these tracks North of the road and the lake-camp have anything to do with the BUK battery. Tents and vehicles can be seen. Here the white tips from the missiles CAN be seen. With this particular line up it seems likely that the strange patterns on the 14-9 image nearby are also from these BUKs parked in the field. Why they do this..., I have no idea. 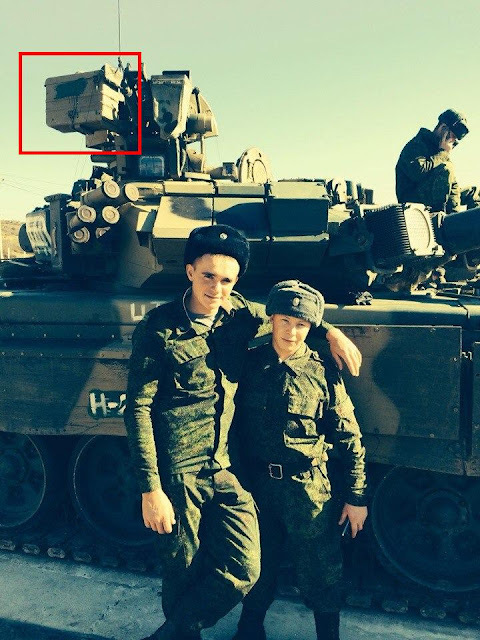 As if they WANTED satellites to capture them :P.
The timing of this camp is during the Debaltseve offensive. That started by the end of January and lasted until February 18th. So it looks like this camp existed to support this offensive. The green areas show activity, but no vehicles can be seen anymore. 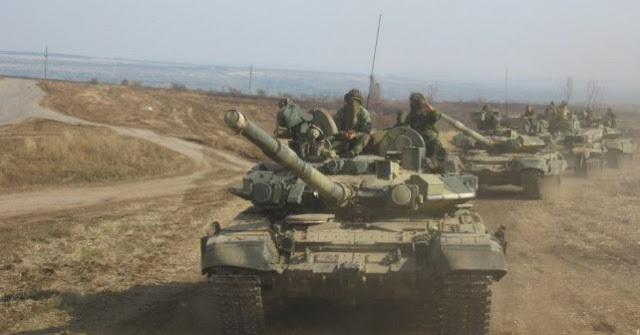 These vehicles therefore most likely had been sent to Debaltseve in the previous weeks. The northern area seems abandoned. The Area of Operation for the BUK-battalion is within the yellow ellipse with a concentration in the light blue ellipse. The large blue ellipse is more than once used as a camping ground. It seems by february 2015 to also have included or merged with the smaller blue area. Whether the BUK-battery was still operational by that time is unclear, but there is a good chance it relocated or even stopped. 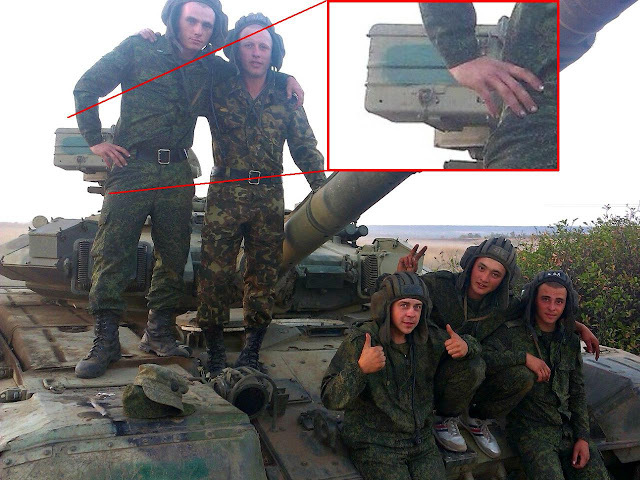 Therefore we should conclude that these tracks are also made by the same BUK battery. Tracks visible on a July 20th satellite image are made PRIOR to that date. They had been made anywhere between June 29th and July 20th. 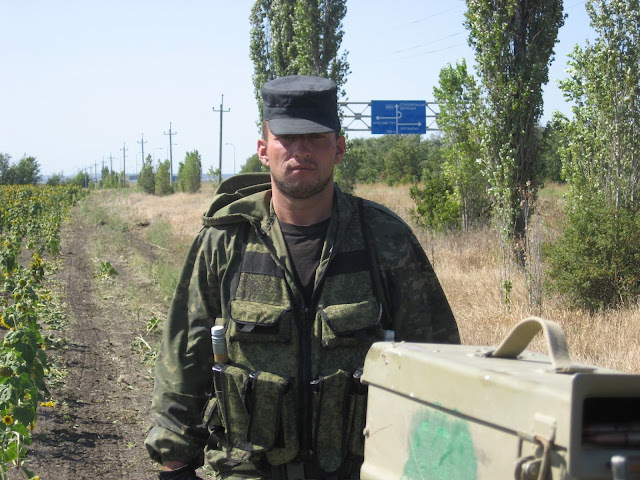 It is safe to assume that the BUK battery was already there and operational on the fatal July 17th. 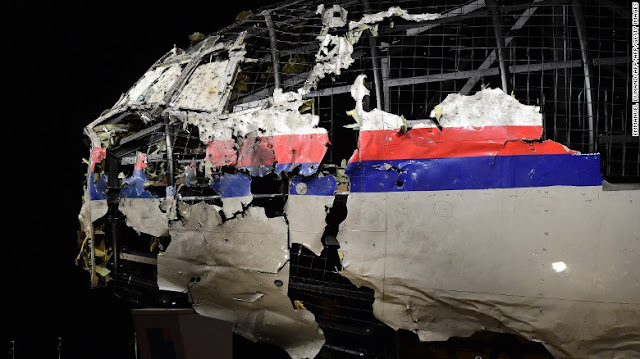 That means it was on 25 kms distance of the BUK launch site that brought down MH17. An ideal distance to setup communications with the BUKs on Russian soil. 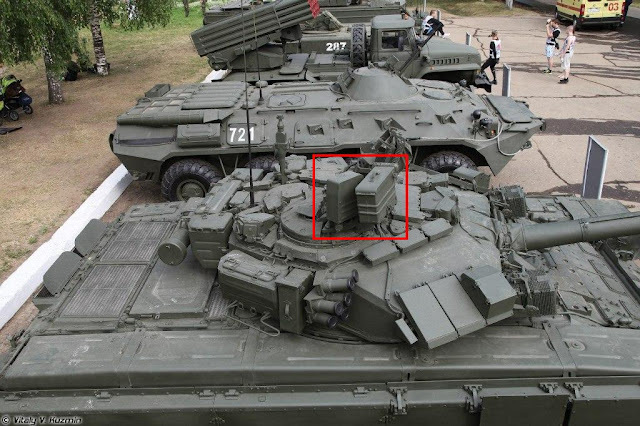 Most likely this Russian BUK battery communicated with the MH17-BUK and got it's data and final instruction from Russians commanders within Russia territory themselves. 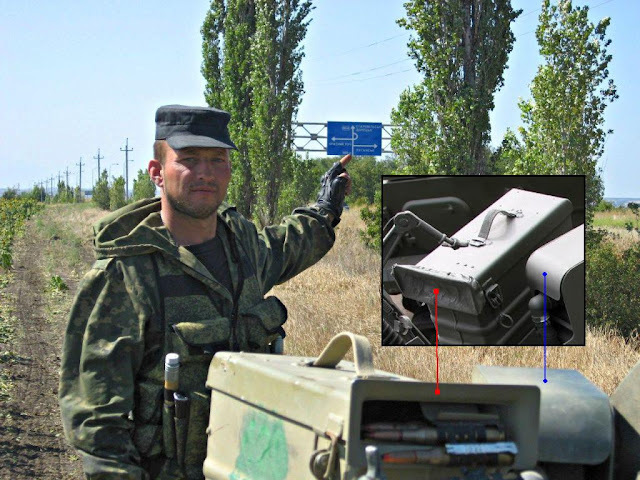 Right from the start after MH17 was taken down, I said there must have been a Russian BUK battery South of Marinovka. Then I found positions West of Kuybyshevo with radars. 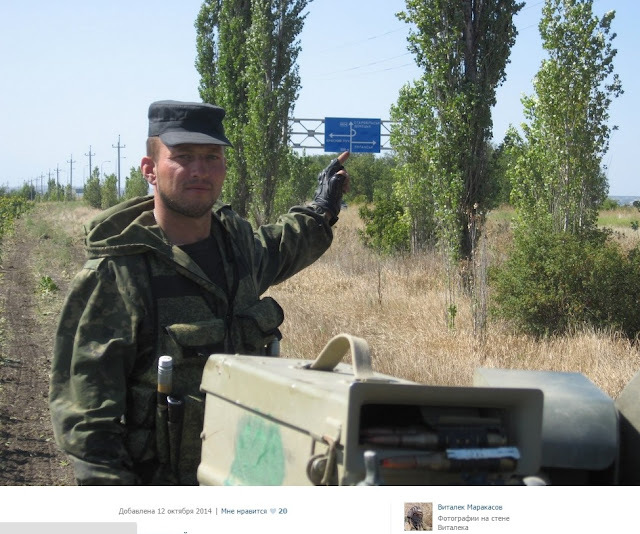 Then images of BUKs East of Kuybyshevo appeared posted on VK. Then satellite images appeared showing BUKs parked in a row for all to see. The sceptical, truthers and trolls kept arguing on and on. Now I have found (with a little help from Google and such) evidence the battery was indeed operational during that fatal day. Now there are also a 16-7 and 23-7 map of the area in Google Earth.